Available: 18x20, 18x30, 18x25, 18x40, 24x20, 24x25, 24x30, 24x40, 48x25. 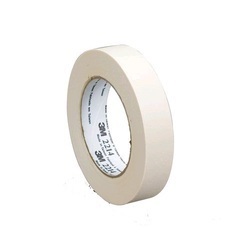 Our organization offers a wide assortment of Masking Tapes, which is offered to the clients at cost effective prices. These tapes are used in painting process to cover areas which need not be painted. Made using easy-to-tear paper, these tapes have weak adhesive which can be easily removed without causing damage to the newly-applied paints. For the automotive industry, Intek manufactures Masking tapes with crepe paper as backing, for application during paint masking. These speciality tapes are also highly confirmable and easy to apply on curved surfaces. They can be conveniently removed without leaving behind any residue. 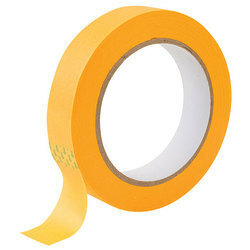 We can supply quality masking tape for general & high temperature application in jumbo and slit rolls form. We are looking query from Karnataka, Andhra Pradesh, Telangana, Tamil Nadu and Kerala Only. masking tapes are used for packaging . As a 3M Masking Tapes manufacturer our products have excellent adhesion, tack and good cohesion strength. The adhesive is specially formulated rubber based adhesive for high adhesion application. It also has good resistance to solvent, oil and water. Most suitable for indoor and protected outdoor environments. We are the distributor and trader of wide array of 3M Masking Tapes. 3M Masking tapes are one of the earliest innovations of the company. The assurance provided by decades of testing in the automobile sector - masking tapes have become one of the brand ambassadors from the entire product range.